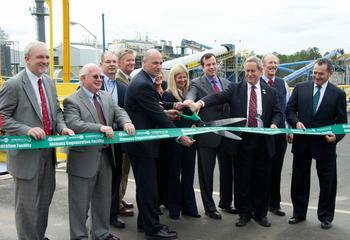 AIKEN, South Carolina, March 13, 2012 (ENS) – A new biomass cogeneration facility was ceremonially opened Monday at the Department of Energy’s Savannah River Site in Aiken to replace an old, polluting coal-fired power plant. Cogeneration is the production of electricity and heat from a single fuel source by capturing the heat lost during electricity production and converting it to steam or hot water. Cogeneration systems are 60-80 percent efficient; by contrast the traditional power plant is about 30 percent efficient. The SRS biomass cogeneration facility replaces a deteriorating 1950s-era coal-fired power plant and oil-fired boilers with a biomass-fueled steam cogeneration plant and two smaller biomass-fueled plants. Communities near the Savannah River Site will benefit from reduced air pollution and the new plant will avoid an estimated 100,000 tons of greenhouse gas emissions per year. The new power plant is expected to generate $944 million worth of savings in energy, operation and maintenance costs over the 20 life of its contract. It is expected to save $34 million in utility costs in the first year alone. 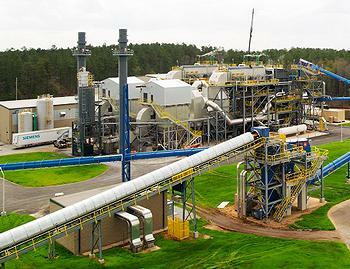 Energy savings result from switching to biomass fuel and installing new, more efficient equipment that better matches the electricity demands of the Savannah River Site. The Savannah River Site, a federal government property, helps maintain the U.S. nuclear stockpile by replenishing the tritium in the weapons, Radioactive tritium, which ensures performance of nuclear weapons, has a half-life of 12.3 years, so it must be replenished, and the Savannah River Site is the nation’s only facility for extracting, recycling, purifying and reloading tritium. In addition, a Mixed Oxide, or MOX, Fuel Fabrication Facility is being constructed at SRS to convert unneeded weapons-usable plutonium for use in commercial nuclear reactors. Also at SRS, weapons-usable highly enriched uranium is blended down to make low enriched uranium, which is converted to commercial reactor fuel for use by the Tennessee Valley Authority to power the southeastern states. SRS also stores the excess plutonium from the Rocky Flats Site near Denver, Colorado; the Hanford Site in Washington state; California’s Lawrence Livermore National Laboratory, and the Los Alamos National Laboratory in New Mexico. The site stores plutonium from its own FB Line, constructed in the early 1960s to receive plutonium-239 nitrate solution and convert it to solid metal buttons, each the size of a hockey puck. The highly radioactive buttons are stored in stainless steel cans while the deactivated FB Line awaits its end, to be determined by the Department of Energy after evaluation and public comment. The new biomass cogeneration facility is the single largest renewable Energy Savings Performance Contract in U.S. history. ESPCs are contracts in which private companies finance, install, and maintain new energy and water efficient equipment at federal facilities. The government pays no up-front costs, saving taxpayer dollars, and the company’s investment is repaid over time by the agency from the cost savings generated by the new equipment. This allows the government to use the private sector to purchase more energy-efficient systems and improve the energy performance of their facilities at no extra cost to the agency or taxpayers. The Department of Energy signed onto an ESPC with Ameresco in 2009 to finance, design, construct, operate, maintain, and fuel the new biomass facility under a 20-year fixed price contract valued at $795 million. Local forest residue and wood chips, and bio-derived fuels will be the primary fuel source for the cogeneration facility, which has the capacity to combust 385,000 tons of forest residue into 20-megawatts of clean power annually. In February, the SRS biomass cogeneration facility received Renewable Energy World’s 2012 Excellence in Renewable Energy Award for Biomass Project of the Year.